How do you like your lobster rolls? The concept of the perfect lobster roll is a hotly debated topic. Lobster salad or plain lobster? Hot or cold? Should the lobster be served on lettuce? Should it be tossed with celery? When you’re not walking the streets of Maine, having a lobster roll is a special and rare experience, one that can easily cost you $20 a roll. You have every right to demand perfection: your idea of perfection, or be certain to get what you want and make it yourself. From the moment we got off the plane, Steve and I started sampling lobster rolls. After four days and over twenty lobster rolls combined, we realized that our visions of perfection are close but still moderately different. 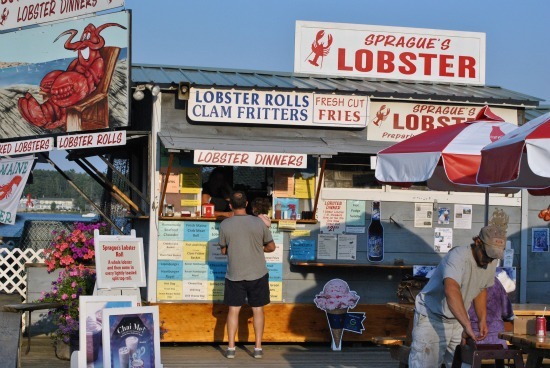 Steve’s ideal lobster roll is what Abbott’s in the Rough calls “Lobster on a Roll” : the meat of a 1 1/4 pound lobster, cooked to perfection and heaped on a toasted and buttered hot dog bun, drizzled with a little cup of drawn butter. This is the purist’s lobster roll. All lobster and no effort: what’s not to love? No mayo. No lettuce. And most definitely no celery. I dream about that lobster on a roll, and would happily drive for hours to sit at Abbott’s outdoor tables and enjoy it on a red plastic tray, but it’s not a lobster roll in my book. A lobster roll is a sandwich. If the lobster meat is cold, it should be coarsely chopped and tossed with a little bit of mayonnaise so that you’re never confronted with a cold and limp lobster claw. I like to squeeze a little lemon on top to give it a little zest, but never want to see anything green on my lobster roll. And the bun should be warm, toasted, and buttered to contrast the chilled lobster salad. Do I even need to mention that the bun should be a standard hot dog bun? Serving lobster salad on anything fancier would be heresy. 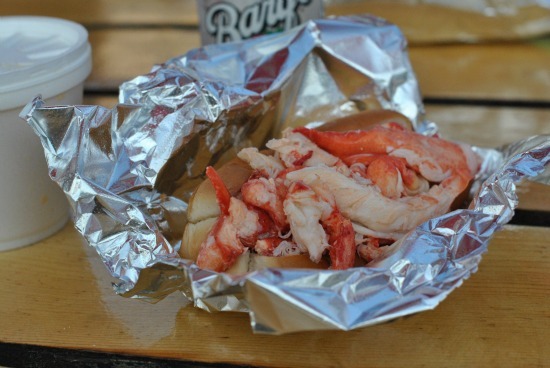 No chintzing on the lobster – there should be an entire 1 1/4 pound lobster on each lobster roll. I also find that no matter how fancy a restaurant is, the lobster roll just doesn’t taste as good as those served outdoors with seagulls flying overhead. You can take a risk ordering a lobster roll in a city somewhere, or you could make your own. After a few months away from Maine, I’m sure Steve and I will start craving lobster again. Here’s how we’ll make our perfect lobster rolls. Plunge your lobster in a big pot of boiling water. Boil it for 10 minutes, until it is bright red. Remove it from the pot and let it cool slightly. Crack the lobster, and remove the meat. Place it in a bowl in the fridge to cool. Don't throw out the shell! Keep the lobster shell in a ziploc bag in the freezer until you have time to make lobster stock. Once the lobster is cool, coarsely chop it with a butcher's knife and toss it with the mayonnaise. Put back in the fridge until the bun is ready. Toast the hot dog bun in a 375 degree oven until lightly toasted and warm. Slather with the salted butter. Heap the lobster salad on top. Squeeze a little lemon juice on top and enjoy immediately. Bring a large stockpot of water to a boil. Plunge the lobster in the boiling water. Boil for 10 minutes, until the lobster is bright red. Remove from the pot and let cool slightly so that you don't burn yourself when handling it. Meanwhile, toast the hot dog roll in a 375 degree oven until hot and lightly toasted. Slather it with a tablespoon of salted butter. Melt the other tablespoon of butter and set aside. Crack the lobster shell and remove the meat. Chop it roughly with a large butcher knife. Heap the meat on the hot dog roll. Drizzle with the butter and a few squeezes of lemon juice. Enjoy immediately with hot roll, hot lobster and perfection. And just in case you were wondering, our two favorite lobster in the rough spots are Abbott’s in Noank, CT and Sprague’s in Wiscassett, Maine (across the street from the very trendy Red’s Lobster). How about you? Please share. Steve and I just may be crazy enough to plan an entire vacation around your recommendation.